"Had a great trip. Accomodation was very good and tour guides Adam, Ravi and Joe were..."
"WOW! Have just finished the most amazing tour of Sri Lanka with Intro Travel. 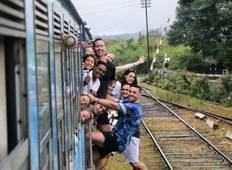 When..."
"I had an amazing experience with Geckos Adventures in Sri Lanka. Awesome Country..."
"Wow, what a great tour! Really nice blend of history, culture, wildlife and spectacular..."